I feel like I’m on an ‘icon wine’ streak after yesterday’s Dom Perignon note. So heck, why not carry that forward. Here are two very different wines that both have Grange in their name. In the Aussie corner is the Penfolds Grange 2005; easily our most famous red wine. Then, in the European corner is Grange des Pères, the cult Languedoc red. It’s like a cross-hemisphere death match. 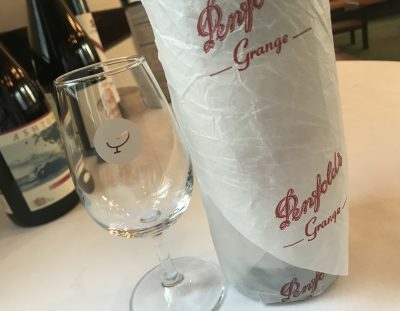 The Penfolds wine is easily the most expensive of the two (and with forty odd years headstart), the Grange des Pères much rarer. Interestingly, what they share – beyond the name – is they feature Shiraz/Syrah and Cabernet Sauvignon in the blend. How ’bout that! A blend of 96% Shiraz and 4% Cabernet Sauvignon. From first whiff this is quintessential Grange. A little VA and then a cavalcade of very rich fruit and very sweet oak. This 2005 sits somewhere between caricature and classic I think, with the caramel American oak so dominant (still!) and everything else dialled up to 11. You get the feeling that the warm, ripe year fruit is going to struggle more and more to keep up in the future too. Still, you can’t hide the silky, coffeed pleasure. It’s a lovely cosseting, mouthfilling richness, a sensation that you really are drinking expensive red wine, all lavishness at every corner. In good shape at 12 years old, though on the cusp of secondary flavours. The length is absolutely notable; this is serious red wine, though more about fruit impact than tannins. Ultimately, this has a place and deserves acclaim based on length of flavour and hedonism alone (which is reflected in the score). But as a drink? I couldn’t finish a glass. Drink: 2017-2030. 18.5/20, 94/100. 14.5%, $700. Would I buy it? No. 40% Syrah, 40% Mourvèdre, 10% Cabernet Sauvignon, 10% Counoise. The biggest challenge with this red from the hills around Anaine (a beautiful part of the world if you’re around there) is that it isn’t an easy wine either. The nose here is wild – saddles (hello old mate Brett), bone broth, tomato leaf, cooked beans and garrigue (which is basically wild rosemary, also grows near the winery. Smells amazing). This isn’t modern and polished, it’s a bumpy ride. The palate too is very savoury, dry, long and pokes out in odd directions, with an ironstone meaty ferrousness that is faintly bitter. Did I mention this is a ride? There’s a length to this though, an unquestioned, ultra-low-yield intensity to offset the wildness. It’s nowhere near as lavish and easily recognised as ‘expensive wine’ as the Penfolds Grange. But the outré personality and savoury, superstar intensity make this quite a drink (to my tastes). Worthy. Best drinking: 2019-2030. 18.5/20, 94/100. $180. Would I buy it? I’d share a bottle. Hi Andrew, very interesting. Price on the GDP? Great article, 2 shades of Grange. Small volume vs big volume, France vs Australia, Innovation vs Innovation. Interestingly, the new Australian wine landscape is shaping up more like the small Grange. Laurent Vaille is the most pragmatic winemaker and viticulturist of all, all he cares about is his own vineyard and making wines from his vineyard years after year and then drinking them – all that truly matters. The future of Australia is with the small Grange. The past success? The big Grange. Both so important! It is tempting for winemakers to focus on single vineyards and make the best wines from them year after year but equally tempting to keep making multiregional blends… which have made some of the best Australian wines.